So we go! After one week of farewells with both parents, we have departed from Switzerland, to be precise from Greppen, on our round-the-world-trip. Before departure we spent significant time packing and preparing, managing to pack all our stuff into 16kg (Marta) and 18 kg (Sam), split into one small carry-on-suitcase and one backpack each. Our first stop was Vienna - just to change the trains, and a proper stop was planned for Warsaw where we stayed two nights with Marta’s friends Kasia and Pawel, from her university. 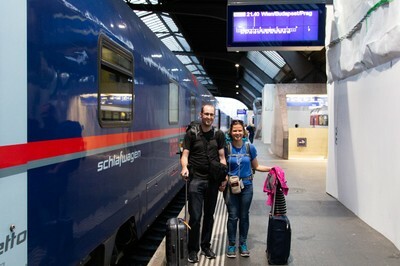 For the train Zurich – Warsaw, we chose a two-person-compartment in the sleeping wagon until Vienna and normal seats in the Euro City from Vienna to Warsaw. The train went on time and after a moderately comfortable night of sleep, a nice breakfast was served in the morning (included in the ticket price). To our surprise, the two-person-compartment was smaller than expected (see photos). There were two beds, one above the other, and space for two people standing. It is definitely good to share such a small space with somebody you know. 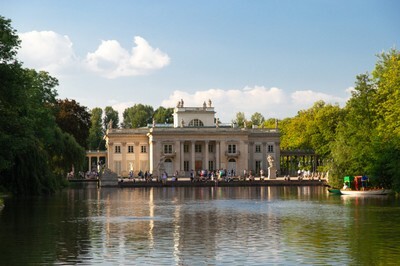 In Warsaw, we arrived in the late afternoon of Friday 20 July, and spent most of the evening resting with Kasia’s family. On Saturday, we walked around the Warsaw Old Town and learned about the Warsaw history, the city battered by many invaders, wars, uprisings and unrest. After the walking tour, we ate cake and drunk refreshing drinks at the famous Café Blikle, which is still the favorite place for elderly Warsaw ladies, who come there just out of fashion. Later in the day, we strolled around Royal Park Lazienki, which in this beautiful and sunny weather was presenting itself at its best. Many newly weds were photoshooting their wedding sessions around the Palace on the water or the benches among the trees. It has been some years since Marta was in Warsaw and she was positively surprised with most developments. More people and more traffic are visible, but the city is even cleaner and well taken care of. New restaurants and cafes catering to vegetarian and alternative tastes are more abundant and one can really find some special places. Overall, the one day in Warsaw we had was a great experience. In the evening we had a farewell dinner with Kasia’s family and prepared ourselves for the train to Belarus, which was leaving at 8:40 the next morning.